Homemade Zucchini Spaghetti With Lemon - Oh My Veggies! Before I started blogging, I didn’t spend much time thinking about vegetarianism. Having stopped eating meat at such a young age, it was simply a way of life. I never felt a longing to eat meat or looked at a restaurant menu and thought, “Oh, I really wish I had more options.” I didn’t talk to people about the fact that I didn’t eat meat unless they brought it up, just because not eating meat was as fundamental to me as the fact that I have blond hair and green eyes. Even after I started blogging, I was hesitant to label my blog as a vegetarian one–I just wanted to be known for good food, not good vegetarian food. But eventually, I embraced the label and here we are today. And now that I do label myself as a vegetarian blogger, I hear from so many people who struggle with vegetarian cooking–whether it’s going vegetarian completely or just a few days a week. Which sounds like such non-advice, right? But I think when people start a new diet, whether it’s vegetarian, vegan, paleo, low-carb, whatever, they tend to do one of two things. They might jump in to their new way of eating a little bit over-zealously. They fill their fridge with tofu and eat salads for every meal. This usually results in burn out. The second thing I see people doing is trying to fit vegetarian cooking into their old cooking paradigm. This involves a lot of meat substitutes. I’m not opposed to making veg-friendly remakes of classic recipes (I even wrote a post about it), but when everything you eat is an imitation, you start craving the real thing again. So by “eat delicious food”, I mean–eat food that you love! Food that’s tasty in its own right, and not in relation to how it would taste with meat in it. 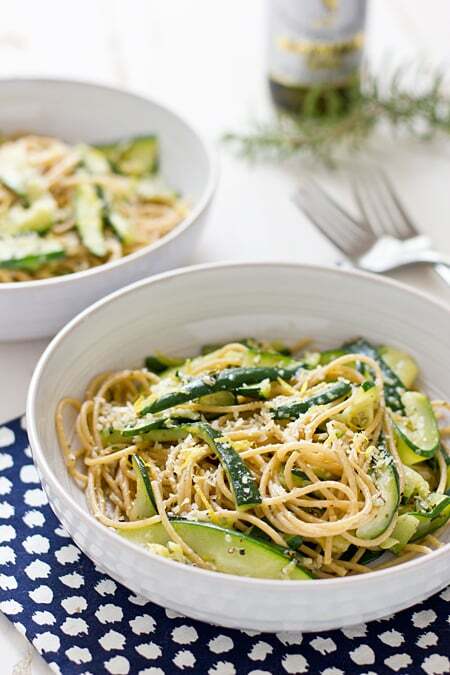 This Zucchini Spaghetti with lemon zest recipe is a perfect example. It’s not Spaghetti Fauxlognese or Spaghetti and Soyballs. 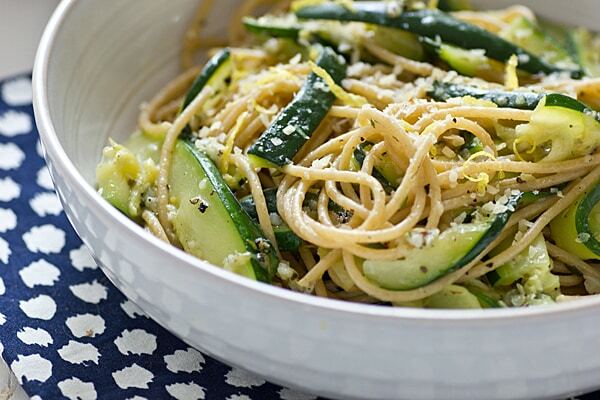 It’s spaghetti tossed with zucchini, fresh herbs, and lemon zest. It’s easy and unfussy, but delicious. The recipe is from Mary McCartney’s new cookbook, Food: Vegetarian Home Cooking , which is full of those basic, simple recipes that shine on their own (although there are a few in here that use meat substitutes). Mary McCartney, of course, is the daughter of Linda McCartney, who is well-known for her line of vegetarian foods as well as her vegetarian cookbooks. Food is brimming with Mary’s bright, colorful photographs of fresh vegetables, family life, and finished dishes. The recipes in Food don’t use strange ingredients and don’t require a lot of skill in the kitchen–they’re recipes like Black Bean, Sweet Corn, and Feta Tacos and Shepherd’s Pie. They’re the types of dishes that you make for your family over and over again, sometimes so many times that you don’t even have to consult the recipe anymore because you know it by heart. Anyone can make these recipes and this is the book’s charm. It truly is vegetarian home cooking and if you’re still finding your way as a vegetarian, this book is a great cookbook to add to your collection. Enjoy this zucchini spaghetti dish! 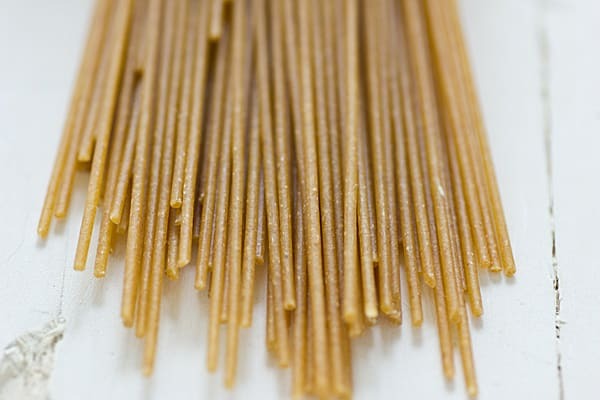 A simple pasta dish flavored with lemon zest, garlic, and fresh herbs. Reprinted with permission from Sterling Publishing. Although the book says this recipe serves 2, we got 4 servings out of it. Disclaimer: I received a copy of Food: Vegetarian Home Cooking for the purpose of this review. There are affiliate links in this post, so if you were to make a purchase from them, I would get a small percentage of the sale, the proceeds of which will go towards this sweet llama t-shirt. What a beautiful, simple pasta dish! I’d be happy making this a couple of times per week. Featuring this on my Facebook page tomorrow. Would this make good leftovers? I haven’t had leftovers of it, but I think it would work out fine. Totally love what you say at the beginning of this post. Thank you for your blog and great recipes. I was recently told to eliminate meat for health purposes, and I’m not a huge veggie person, so initially the thought was overwhelming. It’d be easy for me to just go and buy a bunch of salad, but that won’t fill me for long. Not to mention it can get very boring. A while back I started on this dietary change course, and learned that there needs to be variety. Finding ‘yummy’ food that fills me definitely is the key. Looking forward to trying out this recipe. Yes, I’ve seen a lot of people try to go vegetarian and they overload on salads and tofu, then they get bored and go back to eating meat. There is so much variety in the vegetarian diet, but a lot of people don’t realize it. Good luck with the changes to your diet! I’m doing this for Paddys day, as it’s green white and gold….Perfect. This is almost exactly how I do it, BUT it’s getting extra delicious with some finely sliced chillies thrown in – that heat works really well with the citrus-y flavours (imho), and the red/green/yellow looks really nice too. As for leftovers: works great, fried in some more olive oil .. mmhh. Would you be willing to give us permission to use your photos on our site and social pages? 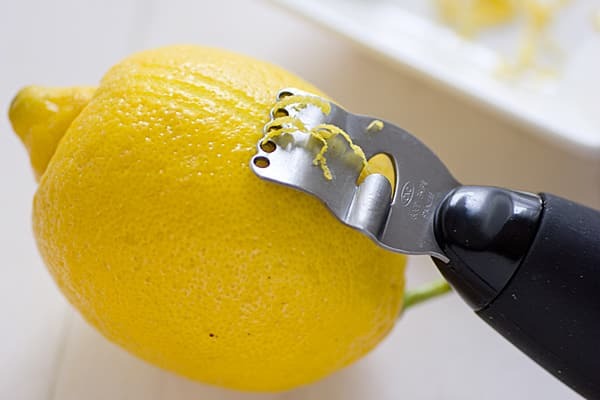 We will link back to your site for the recipe and give you proper photo credit.